On August 28, 2017 area code 564 was put into service as an overlay of area code 360. Ten digit dialing (area code + seven digit number) became necessary in the 360/564 overlay because different homes in the same geographic area can have the same seven digit phone number but each would have a different area code. Clallam County, Clark County, Cowlitz County, Grays Harbor County, Island County, Jefferson County, King County, Kitsap County, Lewis County, Mason County, Pacific County, Pierce County, San Juan County, Skagit County, Snohomish County, Thurston County, Wahkiakum County, and Whatcom County. 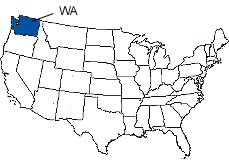 Area code 360 serves most of western Washington except for the Seattle metropolitan area which is served by area code 206. Area code 360 serves the larger cities and communities of Bellingham, Bremerton, Lacey, Longview, Marysville, Mount Vernon, Olympia, Port Angeles, and Vancouver in addition to many smaller communities.